Sparksey4869 Model Trains: Wagons built for others. Two Steam Era Models FQF container flats. VR container flats painted VR red and weathered. Steam Era Models L 791. Cement hoppers painted aluminium and weathered with grey paint and real cement powder. VR phospate hopper painted VR red and weathered with white. Two Steam Era Models GY wagons. VR wheat wagons painted VR red and heavily weathered. SRA open wagon painted SRA blue and weathered. NSWGR Ballast hopper in black weathered with rust. Steam Era Models VHGF 463C. Grain hopper in V/line yellow. 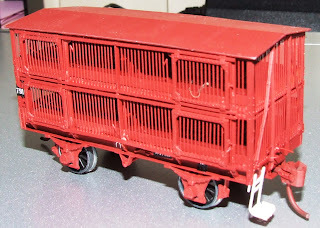 NSWGR Grain hopper in Aluminium (weathered) as built. Quarry hopper in VR red. Labels: Wagons built for others.